English Teddy Bear Goldendoodle puppies! 7 healthy and beautiful pups arrived at the farm early this morning, and we couldn’t be happier. Ruby and the pups are doing well, and taking some well earned rest and bonding time. This litter is named after Beatrix Potter’s famous stories of Peter Rabbit and his friends. Peter was born first. He is a black boy with a blue collar. Benjamin is next, a white boy with a green collar. Jemima was the first girl, black, and is wearing a Pink collar. Mrs Tiggywinkle is also a black girl with an orange collar. A black boy followed – Cottontail, in a Purple collar and Mopsy, a white boy in a Black collar. Lily was a surprise and showed up 2 hours later – a black girl with a special red collar! 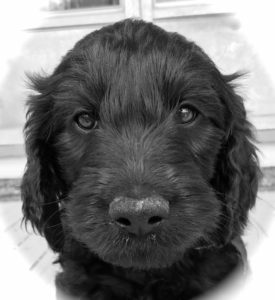 There are availabilities for black puppies but be quick! We hope you enjoy the names and watch their progress on our Facebook page.